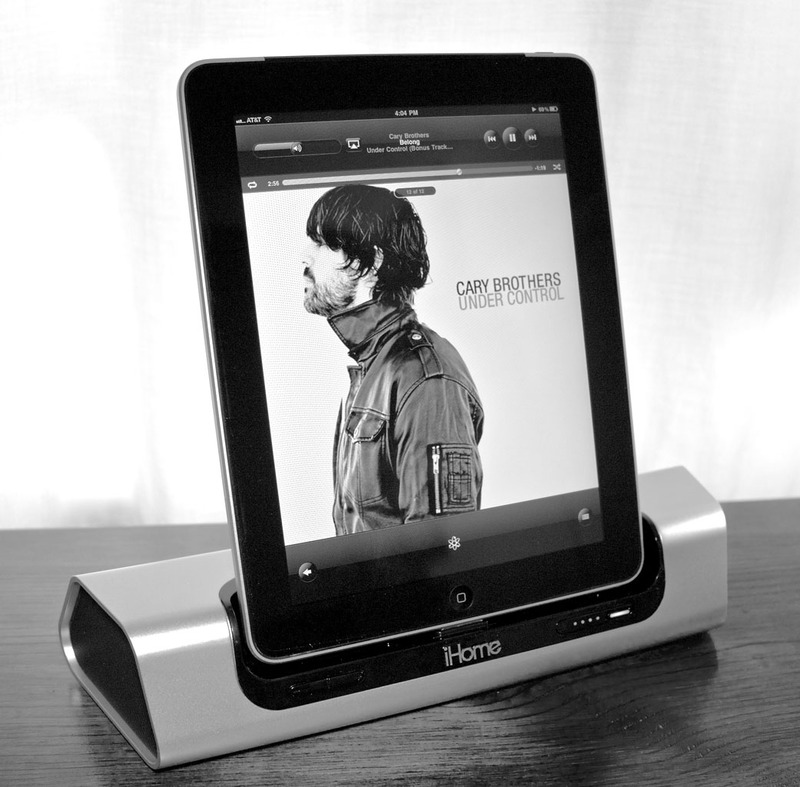 The iHome iD9 is a rechargeable speaker system for iOS devices including the iPad. Unlike the iHome iDM12 that I reviewed earlier, the iD9 requires direct connection via dock or mini stereo jack. Like the iDM12 however, this is a rechargeable device that's easy to take with you on the go. The iD9 is large enough to dock an iPad in the portrait position. The docking area is designed so that you can leave many of the "skinny" cases on and still use the iD9. Where this unit really shines, however, is its output. iHome employs its SRS TruBass and Reson8 sound technology for rather impressive audio quality from a portable system. The speakers are positioned on the ends of the iHome, slightly angled toward the listener. I found that I could position the unit in various spots throughout the house to get just the type of sound I wanted. Audio wise, the iD9 is a very satisfying portable device. When plugged into the wall, it also serves as a charger for your iOS device. The iD9 also works with the iHome+Sleep app for custom alarm settings, social alerts and more; and with iHome+Radio app for global internet radio. While on the road, I still prefer the iHome iDM12 because of its very compact size and wireless connectivity. But around the house or studio, it's hard to beat the iD9 for beautiful output and stylish design. You can learn more about the iHome iD9 at the iHome web site. It sells for $99 at Amazon and other retailers.